Certina DS Action Chrono "Robert Kubica Limited Edition"
CERTINA and Robert Kubica, high demand and talent in perfect measure. Since 2006, the Swiss brand has been faithful partner to the exceptional BMW Sauber F1 Team driver. To highlight their collaboration, CERTINA has chosen to honour their F1 racetrack ambassador by creating the new DS Action – Robert Kubica Limited Edition, an exclusive chronograph aimed at F1 fans and speed buffs. With its audacious nature, latest design and outstanding resistance, the new DS Action is a tribute to fast and extreme lifestyles. Produced in an exclusive series of only 4,000 individually-numbered units, and engraved with Robert Kubica's own signature, it is destined for the wrist of connoisseurs, and fans of competition, technology and innovation. 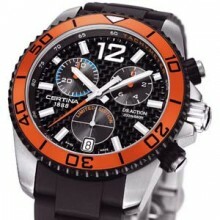 CERTINA detected quite early on Robert Kubica's enormous potential, and became one of his first corporate sponsors. Evidence of their excellent foresight gathered through the various Grand-Prix standings achieved by Robert as a member of the BMW Sauber F1 Team, and his 2008 season was simply remarkable. The natural synergy between the watchmaking brand and the Polish-born star stands out through their many common points: combative instinct, great talent, and an unwavering quest for the best time. The new CERTINA DS Action – Robert Kubica Limited Edition proudly stands with the best, in extreme-sport style. Its exudes a dynamism in perfect aesthetic accord with F1 racing, echoed by the bold colour harmonies of the dial and bezel─bright reminders of the tints on Kubica's helmet. The DS Action is a unique expression in pure line work, around a satin-finished steel case of generous diameter. The racy, toothed unidirectional rotating bezel wears a bright orange-coloured surface with a highly-visible scale, for various measurements. Tachymeter functions are neatly displayed along an inner sloping rim next to the bezel, behind the glass. The timepiece's outstanding resistance is confirmed by a screw-in protected crown and two pushbuttons set inside sporty black PVD collars at their base, and time is shown against a dial with a black carbon background, and a date window at 6 o'clock. The indices, as well as HM hands are faceted and treated with Superluminova, also used on the oversized 12 headlining the dial. Chronograph timing is displayed through a fine interplay of contrasts on three snailed counters equipped with orange hands and a 30-min. counter detailed in blue. Protected by an anti-reflecting sapphire crystal, the watch is equipped with the full Certina DS+ System, and carries a guaranteed water resistance to 200 meters. 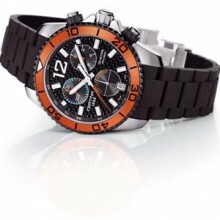 Its Limited Edition status is shown on the dial, while the case back is engraved with Robert Kubica's signature and the mention “Official Robert Kubica Watch”, the individual serial number, and the Certina logo. The model shown (photo) sports a moulded rubber strap, as well as a safety clasp and diving extension, perfect for underwater work. The new Certina DS Action – Robert Kubica Limited Edition is sold in an attractive special display case, and comes with a second bracelet, in stainless steel, and an official certificate of authenticity.